the SPS/IPC/Drives – the exhibition for electric automation technology – will take place at the Exhibition Center Nürnberg/Germany from November 23rd to November 25th 2010. 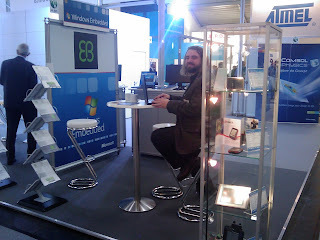 Come and visit the Windows Embedded booth 7A-150; yes is the same location as last year. You can meet me tomorrow, November 23rd at the Microsoft booth. 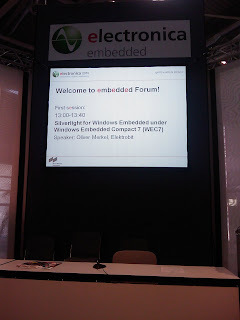 I am looking forward to some interesting discussions about Windows Embedded with you! Have fun and see you at the SPS/IPC/Drives! Windows Embedded CE 6.0 R3 QFEs for October 2010 have arrived! 101028_KB2384080 - When using RNDIS client and DHCP allocator bound to the USB interface, an error may occur when USB cable is unplugged. 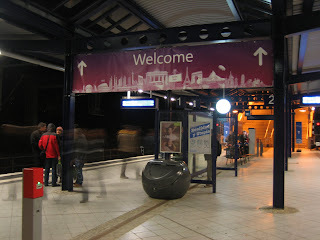 101004_KB2417732 - The current media time is not correctly calculated by the current rate. 101022_KB2437384 - Rotated text may not render correctly due to an issue with the font. 101029_KB2383946 - Calls to ScanVolumeEX() may fail when the volume to be scanned is formatted as EXFAT and has a directory structure that is at least 5 levels deep. 101005_KB982561 - This update addresses an issue with missing download manager. 101013_KB2352410 - This update addresses Internet Explorer issue. 101006_KB2431798 - This update addresses an issue with mouse cursor corruption when connecting from a Windows Embedded CE 6.0 R3 device to Windows 7 over RDP. 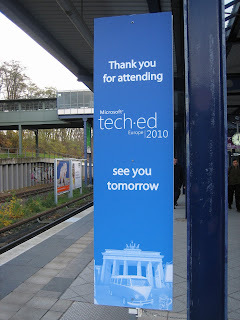 TechED Europe 2010 in Berlin ended earlier today. It has been a great time, lots of interesting talks with fellow MVPs, Microsofties, friends of Windows Embedded, etc. 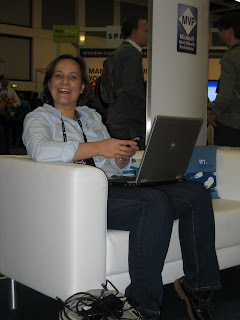 I hope TechED Europe has been as rewarding for you as it has been for me! The Windows Embedded talks have been most interesting as I already outlined in one of my previous posts, you probably enjoyed them as well as the interesting discussions as much as I have! 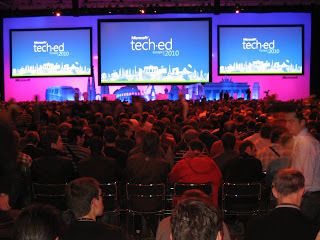 I am looking forward to see you again at next years TechED Europe! 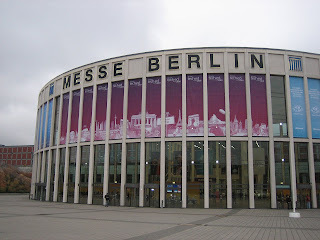 Sadly it’s already the last day of TechED Europe 2010 in Berlin but there are still some very interesting things to do. I am really looking forward to Andy’s and Pierre’s session about Windows Embedded Handheld, the rebranded Windows Mobile 6.5 which starts at 10:30 today. Meanwhile I’d like to take this opportunity to thank the entire TechED staff, Microsofties, especially Pierre Cauchois, this years Windows Embedded track owner, fellow MVPs and all speakers for making this TechED such an amazing and valuable experience, THANKS GUYS! 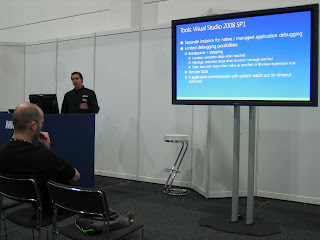 check out the Microsoft MVP program blog for a video of various MVPs on this years TechED Europe 2010. Another video featuring me will be posted later today or tomorrow. 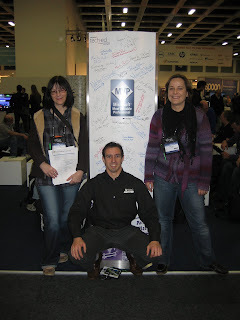 Check out Olivier Bloch’s blog post about Why Windows Embedded does have so little presence on TechED Europe 2010. 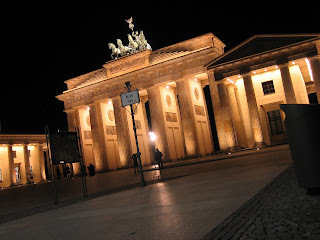 And welcome again from TechED Europe in Berlin. Hope you got a chance to attend the Windows Embedded sessions that were held so far. Even though Windows Embedded is a small track, the sessions have been very interesting so far. Marco Bodoira even played the electric guitar live on stage while presenting his project that won this years Microsoft hobbyist contest embedded SPARK! 2010-11-12: 10:30-11:30 WEM201: The Future of Enterprise Mobile Devices with Windows Embedded Handheld – Hall 7.1a New York 2 – Andy Wigley and Pierre Cauchois. Since I got some requests for the presentation slides: You can find the German and English version of the slides here. Alternatively I will forward these on email request (if not already done). Oliver will introduce you to the upcoming version Windows Embedded Compact 7 as well as its installation experience. Furthermore Oliver will walk you through the development process of a simple Silverlight for Windows Embedded (SWE) Sample User Experience (UX). You will learn that the steps involved are much simpler than working with the current version of SWE for Windows Embedded CE 6.0 R3. In case of questions related to Silverlight for Windows Embedded feel free to contact Jochen or me directly. Today’s Windows Embedded sessions are over, but again, you can download the session slides from your TechED Europe 2010 ScheduleBuilder. Of course those are only the slides and not the demos or interactions. My lunch session where I talked about User Experience development with Windows Embedded Automotive 7 went really great; despite it being lunch time a lot of people showed up! See you at the TechED and enjoy! 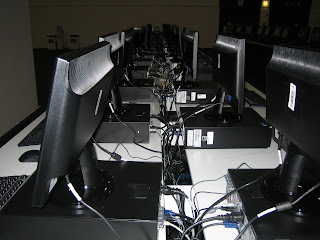 Unfortunately there is no Windows Embedded Technical Learning Center (TLC) at this year’s TechED Europe. You can certainly talk to us during and at the end of our talks in the respective rooms. You can come to the Speakers Lounge in Hall 2.2a. Simply ask at the door for the person you wish to speak to, if we are there, we are happy to talk to you. The elctronica 2010 from November 9th to November 12th in Munich where EB has not only one but two booths. 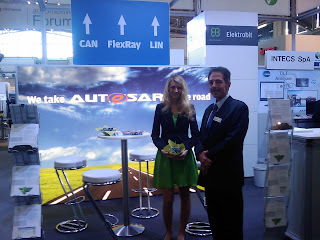 Visit the EB Autosar booth as well as the EB Windows Embedded Partner Pod both in Halle A6 “Software Village”. 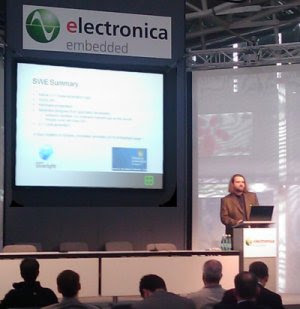 Oliver Merkel, who also wrote a few articles on this blog just held a presentation at the electronica about Silverlight for Windows Embedded under Windows Embedded Compact 7. Hope you were able to catch it! Todays Windows Embedded Sessions are over. 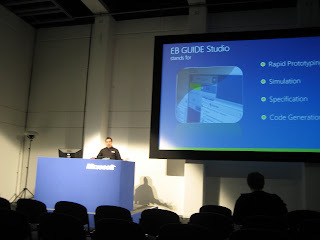 If you have missed them you can at least download the slides from your TechED Europe 2010 ScheduleBuilder. Simply set the Track on the right hand side to Windows Embedded and you will be able to download the slides. 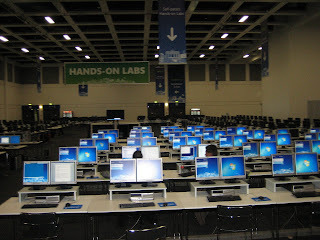 and welcome to TechED Europe 2010 in Berlin. Today was dominated by the pre-conference Seminars. During the key note, Brad Anderson, Microsoft general manager of the Management and Solutions Division, pointed out the upcoming importance of cloud computing. In his discussion he showed Microsoft’s products and visions from “Infrastructure as a Service”, “Platform as a Service” up to “Software as a Service” where the focus is more and more on the user and not on the device. Of course Windows Phone 7 and its connection to the cloud also plays an important role in these concepts. Afterwards the welcome reception was a great opportunity to network with other TechED attendees, Microsoft employees as well as fellow MVPs. See you tomorrow at the TechED and enjoy! 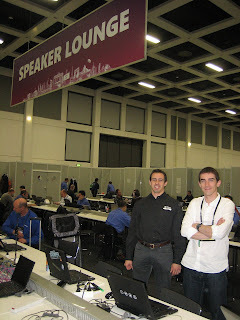 and a warm hello from the TechED Europe 2010 in Berlin where everything is just getting started.